The forested mountains of South China, home to several Ediacaran fossil sites. South China possesses several Ediacaran fossil sites, each containing different groups of taxa. Sites close to the Yangtze River in western Hubei Province yield the Miaohe biota, and macrofossils from the Shibantan Member of the Dengying Formation. In Guizhou Province to the south-west, the Wenghui biota is rich in algal fossils, while the Doushantuo Formation at Weng'an contains acritarchs and potential embryo microfossils. These fossil assemblages record a wide range of organisms, and together make South China one of the richest Ediacaran fossil localities. Fossils of the Lantian and Gaojiashan biotas will be discussed elsewhere. 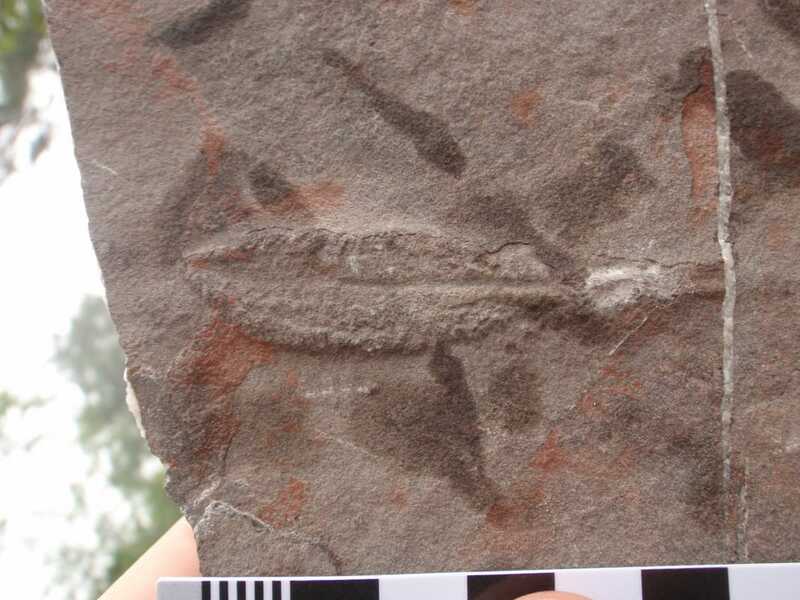 An algal fossil from the Miaohe biota, Dengying Fm., South China, preserved as a carbonaceous compression. The Yangtze Gorges Region is located in western Hubei Province, China, on the banks of the Yangtze River. The region encompasses several important localities where the Ediacaran (Sinian) successions of the Doushantuo and Dengying Formations can be seen. These sections include the Sixi, Muzhuxia, Xiaofenghe, Jiulongwan, Jiuqunao, and Wuhe-Gaojiaxi sections, as well as the stratotype section for the Doushantuo Formation, at the Tianjiayuanzi locality (Lu et al. 2012). Two of the most important sections are the Miaohe locality (with Ediacaran macrofossils in the Miaohe Member), and the Jijiawan locality, where the Doushantuo Formation has been dated radioisotopically to between 635 and 551 million years in age (Condon et al. 2005). These sites are separated by the Yangtze River, with the Miaohe locality being on the northern bank, and the Jijiawan locality on the southern bank. 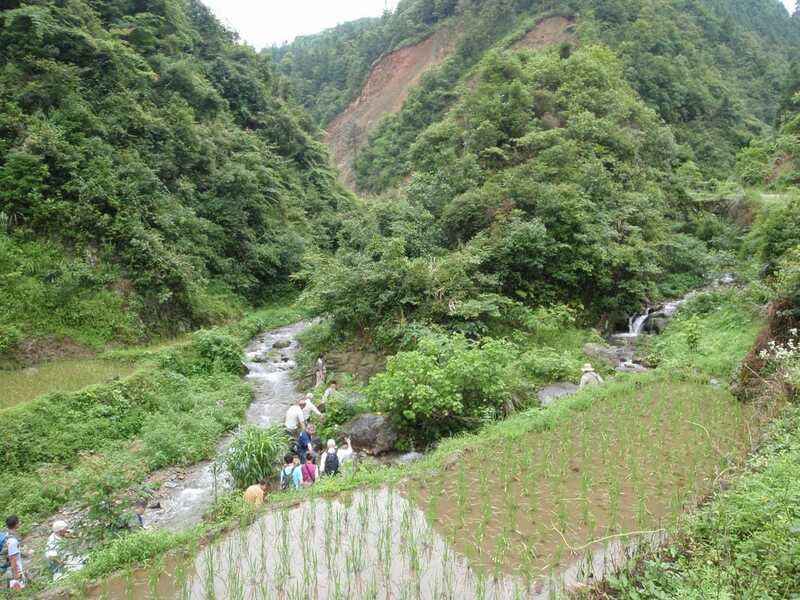 Although the Huangling Anticline around which these sites are located extends geographically to the north, with further microfossil-bearing sections through the Doushantuo Formation in the Zhangcunping area (e.g. Liu et al. 2009), those northern localities are not presently known to contain Ediacaran macrofossils. The Cryogenian Nantuo tillite (considered to record the global Marinoan glacial event) is disconformably overlain by the Ediacaran Doushantuo Formation, which can comprise 250m of carbonates, shales and phosphorites (Xiao et al. 1998), although its thickness varies considerably across the region. The Doushantuo Formation is considered to have been deposited in a largely restricted carbonate shelf environment (Jiang et al. 2011). The Dengying Formation above is predominantly composed of carbonates, with fossils typically found within dolomitic horizons, such as at Wuhe within the Shibantan Member (Chen et al. 2014). The Doushantuo and Dengying Formations have been tracked across a large part of the South China platform, allowing detailed reconstruction of the Ediacaran basin topography (e.g. Jiang et al. 2011). Abundant outcrop, and multiple research groups, have enabled extensive sampling of the units for geochemical study, with variations in carbon isotopes across the basin being of particular interest (Zhou et al. 2016). Understanding this variation, and associated changes in oxygen concentrations and phosphorite formation (e.g. McFadden et al. 2008; Cui et al. 2016), is important in order to reconstruct the environmental conditions under which Ediacaran organisms lived, and indeed the geobiology of the fossil-bearing units (e.g. Duda et al. 2015). Macrofossils were first described from the Miaohe Member in 1978 (Zhu & Chen 1984), and include largely algal fossils (Xiao et al. 2002) and occassional unusual forms (e.g., Eoandromeda, Zhu et al. 2008). Many of these fossils are also recognised from South Australia, confirming that the two regions are likely to be of similar age (Xiao et al. 2013). 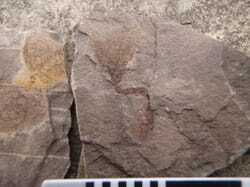 Further macrofossils are found within thinly bedded dolostones and siltstones of the Shibantan Member of the Dengying Formation (e.g. Chen et al. 2014). These were first reported as rare individual specimens, such as Paracharnia (Sun et al. 1987), which is still known only from a single specimen found as float. More recently, serial excavations have revealed that the Shibantan biota includes several taxa typical of the global Ediacaran macrofossil biota (Hiemalora, Charniodiscus, Rangea), new tubular taxa such as Wutubus, and abundant vendotaenids. Other enigmatic impressions such as Yangtziramulus (Xiao et al. 2005; Shen et al. 2009) also occur in this unit. 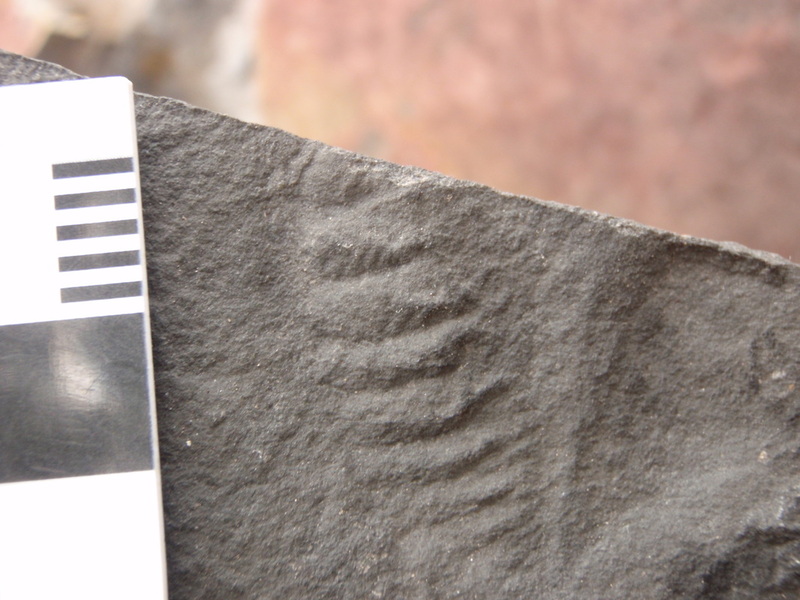 A unusual aspect of the Shibantan Member is an abundance of bilobed trace fossils, which may include evidence for vertical burrowing (Chen et al. 2013; Meyer et al. 2014), alongside the macrobiota. The tubular body fossil Wutubus from the Shibantan Member at Wuhe. A frondose fossil, similar to Charniodiscus, from the Shibantan Member at Wuhe. A regional variant of the Dengying Formation is the Gaojiashan Member, which is known for its tubular body fossils, including Conotubus, Shaanxilithes, Sinotubulites, Cloudina and Gaojiashania (Cai et al., 2010). The Doushantuo Formation at Weng'an is well known for its phosphorites, which are mined in huge open cast pits. Microfossils are preserved in huge abundances within the upper phosphorites within the Doushantuo Formation, and include a variety of acritarchs (Liu et al. 2014), tubular fossils (Cunningham et al. 2015), multicellular organisms (Yin et al. 2015; Cunningham et al. 2016), and structures that have been interpreted as metazoan embryos (Xiao et al. 1998; though whether these structures belong to animals, or are even embryos, has been the subject of intense debate, summarized in recent papers such as Huldtgren et al. 2011; Chen et al. 2014). Since the fossil-bearing levels of the Doushantuo Formation could be as much as 580-600 million years in age, the Weng'an microfossils are important as they potentially record the oldest fossil evidence for animals. Work is ongoing to determine the precise age of this and other fossil localities in South China (e.g. Yang et al. 2016), and the exact nature of the fossils themselves. The nearby Wenghui biota, within black shales of the upper Doushantuo Formation and also in Guizhou Province, possess as largley macroalgal fossil assemblage, similar to that of the Miaohe biota to the northeast (e.g. Wang et al. 2014; Wang et al. 2016). Fossils here are preserved as carbonaceous compressions, but include non-algal forms such as Eoandromeda. 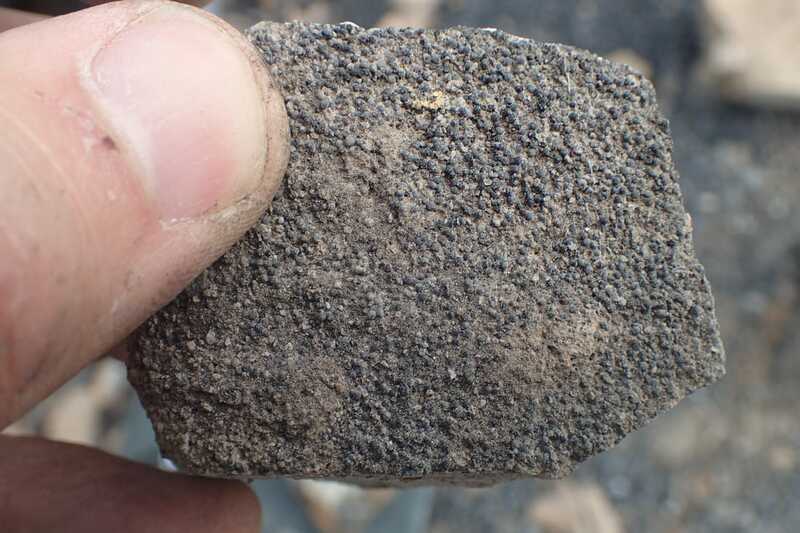 A sample of the black phosphorite within the Doushantuo Formation. Almost every visible black grain is a phosphatised microfossil.